Under Ontario law, some car accidents are so significant and so devastating, that our government has set aside a special set of rules and protocols to deal with such accidents. They are referred to a "catastrophic motor vehicle accidents" or "catastrophic claims". In the legal world, you will hear lawyers, doctors, insurance adjusters and other health care professionals refer to the term "CAT", or "CAT CLAIM" or CAT FILE". If your injuries have been deemed catastrophic, then you will be entitled to a greater variety, and simply put, just more accident benefits. The reason for this is because you or your loved one will need these benefits very badly if the injuries have met the catastrophic injury level. What these benefits are is constantly changing. To give you an example, these benefits have been reduced in the past 4 years, and the government at the request of insurers is constantly scrutinizing the level of funding required for CAT accident victims. This has never sat right with our law firm as we believe that CAT accident victims along with their families ought to be entitled to as much support as possible in order to help them with their road to recovery. Multiple orthopaedic injuries, spinal cord injury, brain injury, loss of limb and paraplegia are common when it comes to catastrophic injuries. These are areas which our law firm deals with every day. In order for your injuries to meet the CAT level, there is a special legal formula or legal test that needs to be followed. Your treating doctor, surgeon or even family doctor will need to complete an OCF-19 Application For Catastrophic Impairment Form. These can be found on our law firm's website, or through the Financial Services Commission of Ontario. 8. an impairment that, in accordance with the American Medical Association’s Guides to the Evaluation of Permanent Impairment, 4th edition, 1993, results in a class 4 impairment (marked impairment) or class 5 impairment (extreme impairment) due to mental or behavioural disorder. Note: If an insured person is under the age of 16 years at the time of the accident and none of the Glasgow Coma Scale, the Glasgow Outcome Scale or the American Medical Association’s Guides to the Evaluation of Permanent Impairment, 4th edition, 1993, referred to in sections (6), (7) and (8) of the above criteria, can be applied by reason of the age of the insured person, then an impairment sustained in an accident by the insured person that can reasonably be believed to be a catastrophic impairment shall be deemed to be the impairment that is most analogous to the impairment referred to in sections (6), (7) and (8) of the above criteria, after taking into consideration the developmental implications of the impairment. For the purpose of sections (7) and (8) of the above criteria, an impairment that is sustained by an insured person but is not listed in the American Medical Association’s Guides to the Evaluation of Permanent Impairment, 4th edition, 1993, shall be deemed to be the impairment that is listed in that document and that is most analogous to the impairment sustained by the insured person. I confirm that the applicant suffered a catastrophic impairment as described in the relevant definition attached to this application. It is an offence under the Insurance Act to knowingly make a false or misleading statement or representation to an insurer in connection with the person’s entitlement to a benefit under a contract of insurance. It is an offence under the federal Criminal Code for anyone to knowingly make or use a false document with the intent it be acted on as genuine and the offence is punishable, on conviction, by a maximum of 10 years imprisonment. Much like the benefits available to catastrophic accident victims, the definition of what sort of injuries will meet this CAT threshold continue to change as well. Our law firm is on the forefront of these changes, and constantly battling large insurers in the Courts in order for these definitions to be more favourable to accident victims and their loved ones, instead of being skewed in favour or the insurance companies. 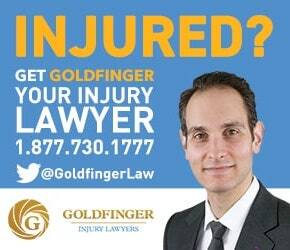 If you or a loved one has sustained, or think you might have sustained a catastrophic injury, call Goldfinger Injury Lawyers today for your free consultation with Brian Goldfinger. Our founder, and directing lawyer will personally meet with you in order to asses your claim and let you know what we can do to help during these difficult times.